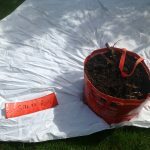 We took up the two shaws planted in our ACC bag and one shaw from the allotment yesterday. Rather disappointed with the results. 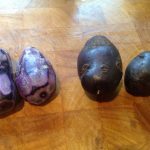 The allotment ones were very small and weighed in at 0.5kg, the ones grown in the bag were 1.5kg but showed signs of potato scab. 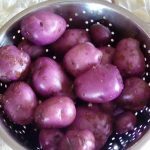 There are various reasons for scab but as we have been growing our bag seed potatoes in exactly the same new compost it can’t be spores retained from previous crops. It may have been a lack of watering – we will have to see what our other crops look like. 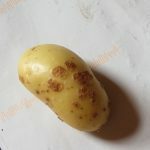 We have posted a couple of photos sent from other growers who were asking about scab on their potatoes. It doesn’t look nice but if you peel back (as we have done on the the potatoes on the left hand side) then they will eat okay. It will impact the storage though and we will keep you posted on how they well these ones keep. 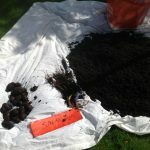 Part of the fun of growing your own!